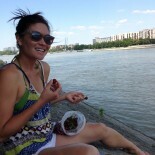 Tip of the Day: Mushrooms | eat. write. smile. Yesterday in class, we tried tens of different mushrooms: Shiitakes, pompoms, oyster mushrooms, white buttons, Portobellos, and hen-of-the-woods, to name a few. I had never been wild about mushrooms before, mostly because they seem gross when you grab them from the refrigerator drawer. The cap surface can be slimy, greyish, and spotted- in other words, unappetizing. That’s why I almost never buy them. Yesterday, we learned there is a better way to store mushrooms, and I think I’m changing my fungi-phobic ways. 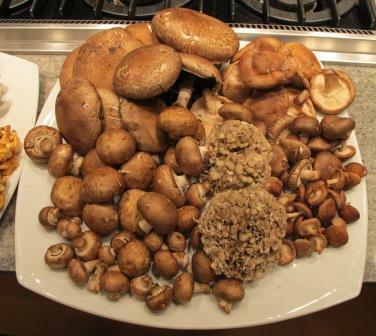 Take mushrooms out of the plastic bag and wrap them in damp paper towel. (This storage method is the best way to keep fresh herbs like cilantro, basil, or Italian parsley, too.) Mushrooms grow from decomposing matter to begin with, so it’s best to keep them out of the bag, where moisture and condensation can collect on the bag surface and encourage spoiling and mold growth on the mushroom surface. When you do want to use the mushrooms, just wipe them clean with the moist paper towel and give them a quick rinse in cold water. Never submerge mushrooms in water or leave them soaking because their fibrous tissue will soak up moisture and make them mushy and flabby. With all these varieties of mushrooms to choose from, I will definitely be eating (and properly keeping!) more fungi in the future. 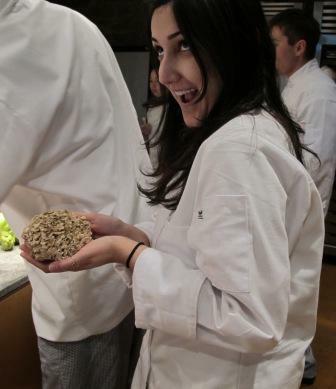 Here my friend Nisha does her best Vanna White impression with my new favorite kind of mushroom, the Maitake mushroom, also known in the west as Hen-of-the-Woods. It looks like coral, but when cooked, it has an earthy, almost meaty taste and a slightly crunchy texture. DELICIOUS! This entry was posted on February 23, 2010 by Ruthie in Uncategorized.